Ean and I are working on some Easter baked goods today. Cupcakes are in the oven and we tackled these little nests last night. 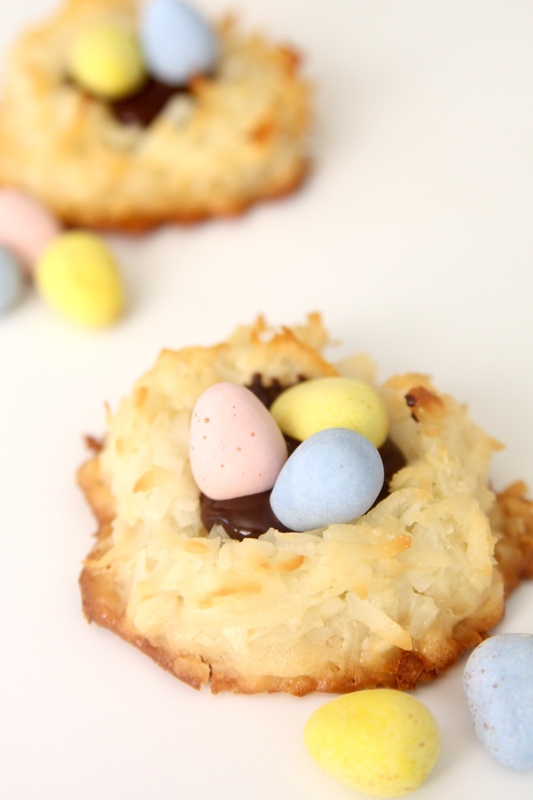 I know you can buy cute little Easter nests but what is better than a homemade macaroon? In a large bowl, stir together the sweetened condensed milk, egg white, vanilla extract, and salt. Stir until combined. Add in the coconut and mix well. With a spoon, scoop up about 2 Tablespoons of the dough and place the dough onto the prepared baking sheet. Form the cookies into the shape of a bird nest. Press down the center with your fingers. Bake cookies for 17 to 20 minutes, or until slightly golden brown. Remove from the oven and press down in the center of the nests again. Cool the cookies on the baking sheets for about 5 minutes or until they are firm and set. Remove with a spatula onto a cooling rack. Cool completely. Once nests have cooled, melt chocolate over low heat. Pipe a teaspoon of melted chocolate into the center of each nest. Top with mini eggs. This entry was posted in Candy, Cookies. Bookmark the permalink.